An active report for Adobe® Flash® Player includes most of the capabilities available in the HTML version of an active report in a visually enhanced, user-friendly report format. An active report delivered as a self-contained Adobe Flash Player compatible file (SWF) allows for faster analysis of large data sets and interaction with the active report. Internet Explorer, Mozilla Firefox, and Opera Internet browsers recognize an active report for Adobe Flash Player as a Shockwave Flash Object. Tip: Any discussion of active reports includes active reports for Adobe Flash Player and for PDF, unless otherwise noted. Select the active report or active Flash output format from the output format drop-down list in the Properties window of Document Composer. You may also use Active Technologies for PDF, which provides the ability to include interactive reports, dashboards, and animations compatible with Adobe Flash Player in PDF documents. Select the active PDF output format from the output format drop-down list in the Properties window. An active dashboard is an extension of an active report. Therefore, all active report features are available for an active dashboard. For more information about individual active report features, see the Active Technologies User's Guide. An active dashboard is best suited for developing storyboards with multiple charts and tables that give you a complete view of a business issue. You can send active dashboards as stand-alone dashboard pages or incorporate them into corporate dashboards. A typical active dashboard displays several different scenarios, each on its own page, that are accessible by selecting the appropriate panel at the top of the page. The following image shows an example of an active dashboard with three scenarios, Revenue Report (selected), Regional Report, and Product Report. The following image shows an active dashboard for Adobe Flash Player. The active dashboard displays several different scenarios, each on its own page, that are accessible by selecting the appropriate panel at the top of the page. 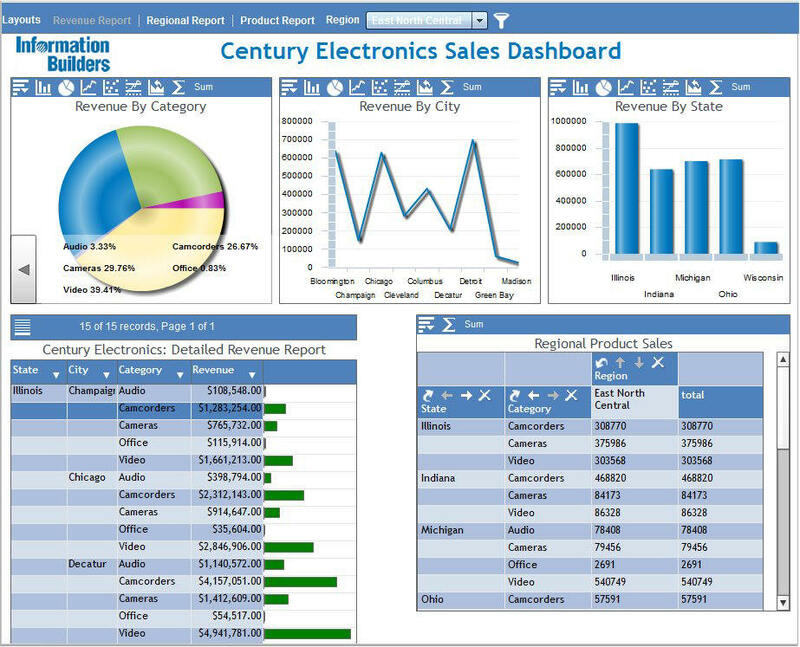 The image shows an example of an active dashboard with three scenarios, Revenue Report (selected), Regional Report, and Product Report. When you create an active dashboard in Document Composer with the active PDF output format (APDF), bookmarks are not supported.